We wanted to upgrade our flock of chickens with some fresh blood, so we decided to buy some chicks. Specifically we wanted some Americaunas, some Golden-laced Wyondottes, some Buff Orpingtons, and some Cornish Crosses (for butchering). Except for the Cornish Crosses, these other breeds are commonly available, decent egg-layers, and just durned pretty. I like a lot of variety in our flock. But buying chicks, much less these specific breeds, turned out to be surprisingly difficult. I called a number of feed stores (locally, as well as Coeur d'Alene) and inquired as to the availability of these particular breeds. What I learned is that chicks are being snapped up like crazy. Also, prices were fairly high, ranging from $2 each for Cornish Crosses to $5 each for Americaunas. Well, despite the scarcity and high prices, it sounds like a lot of people are getting backyard chickens and discovering the fun of producing some of their own food. This is a wonderful trend I applaud to the highest magnitude. So I had to readjust my expectations. While in Coeur d'Alene, we swung by a feed store to see what breeds were available. We found they had Silver-laced Wyondottes (not as handsome as the Golden-laced, but still pretty) as well as Buffs. We bought five of each. They're so irresistible at this age. Holding them is like "chick therapy." Meanwhile we ordered ten Americaunas from our local feed store, and they came in a week later. When chicks sleep, they group together like puppies. Very cute. We'll keep the chicks in the house until (a) they feather out a bit, and (b) the weather warms up enough that they won't get chilled out in the coop. The house is beginning to get that "chick" smell, but it won't be for long. We have 15 Cornish Crosses on order from our local feed store, but they won't be here until some time in June. They'll be ready to butcher by the end of summer, at which time we'll also cull our flock of the older and/or less productive ladies. Meanwhile it's nice to indulge in a little "chick therapy" whenever we wish. You are so right about how cute a fluffy chick can be, they are the neatest thing at that age. I agree there is now way to describe how holding a fluffy soft baby chick can feel. We just started with chicks this year and we love it! We could sit for hours just watching them run around and play! Have you ever heard of Freedom Ranger Broilers before? We have been using those for meat birds for the past 2 years. We get them from a family run operation in PA. They are very healthy and great free rangers. We've tried the reds and blacks both with success. The reds just grow a little faster and have a wider breast. The blacks are more like a regular chicken. We've been very happy with them. This year we started adding to our flock as well with some "Americauna's" which are really Easter Eggers (from a box chain store) and a few leghorns to see how they produce. We plan to try and keep some of the red freedom rangers to produce our own birds next year. We will see how it goes! Our oldest batch is now 12 weeks old and ready to be converted, so I can well remember the chick smell you speak of!!! Our next batch comes this week and we start all over again! Many blessing! In my region of southern Idaho all the feed stores were selling about 6-10 different breeds of chickens and had a pre-order time in March and April where you could order them, ranging from $0.79-2.00 each depending on breed and you had to buy them by the dozen for the preorder. Shipments came in from late March to early May. If you are looking for chicks next year you may contact feed stores ahead of time to see if they do a pre-order for certain breeds. I know for actual in-store sale most of them only carried 1-2 types. Next order you might look into Black Sexlinks for your layers. They only use up about 2 1/2 pounds of feed per dozen eggs compared to the 3 pounds that your traditional dual purpose birds use per dozen eggs. As an added plus mine laid all winter long with no electricity. I had them years ago when I lived on the outskirts of Athol. That's the problem (minor, I realize) that we have here. 5 at a time isn't done. Still. I can't wait until we finally have our own chickens. We are just starting with chickens this year and I'm already looking forward to increasing our flock size. I could spend all day long just watching them! we are lucky, cackle hatchery is 80 miles away, several go togeather each year and combine our order so we get the numbered discount. we will start 100 jumbo cornish in late september, butcher early november (temp/flys). if intersted we built the wizbang chicken plucker (google for plans) works great. We built the wizbang chicken plucker, too, and we can attest to how great it works as well. That chick smell isn't quite as intense if you use sand instead of straw or hay for the bedding. A 50# bag of play sand goes a long way. It doesn't have to be too deep, and we just sprinkle it over the top occasionally to freshen things up, then dump it somewhere we need fertilizer when we move the chicks outdoors. WeI have raised a number of chicks inside, love to hold them too! I've just moved a few more biddies outside, I guess they are tween chicks now. For me the "chicken smell" isn't the poop swampie, but the actual chickens themselves, they have a distinct smell when the start feathering. I love Golden Comets, I have raised Buffs, Rhode Island & New Hampshire Reds and Barred Rocks. The Golden Comets are the friendliest and best layers (year round) I've ever had. Off topic - but Idaho sure has some interesting candidates for Governor. I just watched their debate. Wow. Here in Western Nebraska we had the same problem this year, the very day the feed stores would get their weekly shipment of poultry they would sell out. Not just chicks, but ducklings, goslings, and turkey poults too. I've never seen them sell so quickly, I guess a lot of people are rediscovering the joys of fresh eggs :) We started over with our poultry flock this year. We have Speckled Sussex, cuckoo maran, and aracauna chickens; khaki Campbell, welsh harlequin, and pekin ducks; and 3 geese of unknown breed. I prefer the duck eggs myself, and in the past we've only kept ducks, but my daughter talked me into chickens this year. In case you haven't had Wyandottes before, I should forewarn you they are bigots. We have had both silver and gold for years, and it's common to look into the yard and see clusters of silver and clusters of gold. Of course, the roosters are equal opportunity. Have you ever ordered chicks from Murray McMurray Hatchery? That is who we have ordered from the last three go rounds. We have have been extremely happy with their chicks. We have an order of 50, diverse breeds of chicks coming next week. 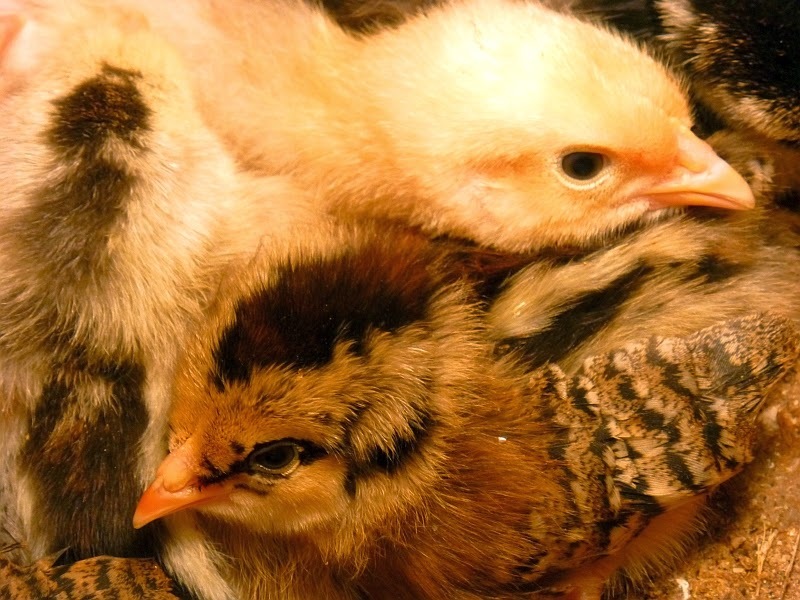 For shipments after April 1, the minimum is 15 chicks, before April 1, 25 chicks. I love my Austrolorps. So many eggs! And they're pretty, too. Didn't realize you could order Cornish X so late in the year but that's a good idea.